An insurmountable obstacle stood between Jerry and his freedom. Recently disabled and confined to a wheelchair, he was unable to use the stairs attached to his mobile home. Jerry couldn’t leave or enter his own home and was trapped because he couldn’t afford to build a wheelchair ramp. Jerry called the Collier Resource Center(CRC) for help. Norma Diaz, program coordinator, knew what to do. She reached out to CRC board member Silvia Puente, who is a Collier County Public Library branch manager — the “go-to” person for Immokalee resources. 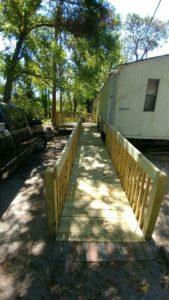 Silvia then contacted a local non-profit which used private funds and local volunteers to build the ramp. When Jerry said he also needed prepared food because he was unable to shop and cook, Norma arranged for Meals on Wheels. They now deliver meals regularly and, while there, check on Jerry’s well-being. Jerry is, once again, happily independent and enjoying his freedom. CRC staff and volunteers don’t give up when a client’s request is complicated. They know who to contact and how to get the job done. The result: A happy ending!